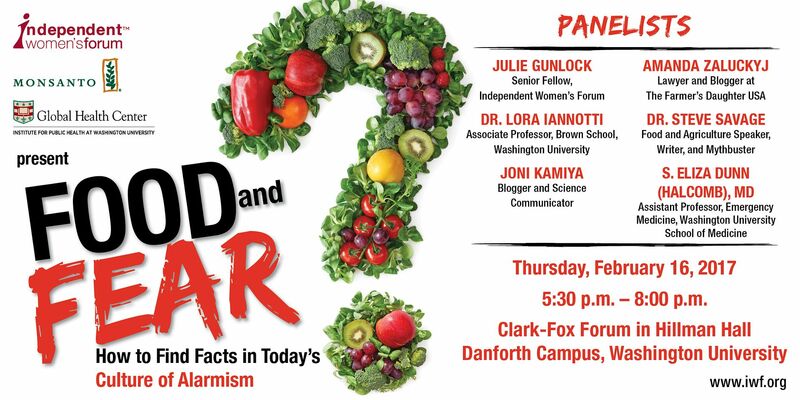 (WASHINGTON, DC) -- On Thursday, February 16th, the Independent Women's Forum, Washington University's Global Health Center, and the Monsanto Company will host a must-attend panel discussion on Food and Fear: How to Find Facts in Today's Culture of Alarmism. The event will be held in St. Louis, Missouri at Washington University's Danforth Campus. Americans continue to get mixed messages about food and nutrition. Consumers are increasingly having trouble finding reliable information. The all-star panel will address food fears and how to sift through the alarmism to find science-based information to complex nutrition and agriculture issues. Panelists will tackle the following questions: What are the origins of food fears? How have food fears altered consumer behaviors? Why are women targeted for fear-based marketing strategies? What can the science, medical, agricultural, and academic communities to do help provide consumers better information?